CROZET, Va. (AP) — In a story Jan. 31 about a fatal train crash carrying dozens of Republican members of Congress, The Associated Press, relying on information from a congressman at the scene, misidentified who was killed in the pickup truck. It was a passenger who died, not the driver. CROZET, Va. (AP) — A train carrying dozens of Republican members of Congress to a strategy retreat in the countryside slammed into a garbage truck in rural Virginia on Wednesday, killing one person in the vehicle and sending several lawmaker-doctors rushing to help the injured. No serious injuries were reported aboard the chartered Amtrak train, which set out from the nation’s capital with lawmakers, family members and staff for the luxury Greenbrier resort in White Sulphur Springs, West Virginia. At least two other people in the truck were reported seriously hurt. 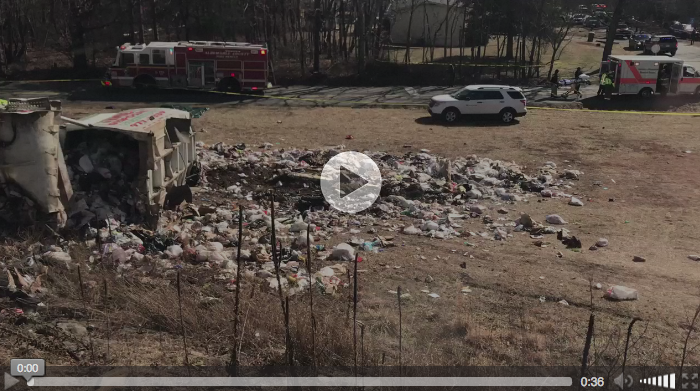 The collision happened about 11:20 a.m. in Crozet, about 125 miles (200 kilometers) southwest of Washington, tearing the truck in two, crumpling the nose of the locomotive and scattering trash alongside the tracks. Authorities gave no details on the cause of the wreck, which took place at a crossing protected by gates, flashing lights, bells and warning signs. The National Transportation Safety Board sent a team to investigate and would spend several days at the site, spokesman Earl Weener said Wednesday night. “A guy was up here just yesterday or the day before taking a look at them,” he said. “The first gentleman was somebody who had really, really, really devastating injuries. We did try to resuscitate, but ultimately you had to realize it wasn’t possible,” Dunn said. The Albemarle County Police Department identified the man killed as Christopher Foley, 28, of Louisa County. “My role was quite simple: I picked up his feet so the blood in his feet would go to his heart and his brain,” Cassidy said. Sen. Jeff Flake of Arizona said seeing the lawmakers who are doctors tending to the injured reminded him of the shooting of Rep. Steve Scalise at a GOP baseball practice last June. Minnesota Rep. Jason Lewis’ staff tweeted that the first-term congressman was among those taken to the hospital and was later discharged after suffering a concussion. Others aboard the train reported bumps, bruises and sore joints. Later Wednesday, Pence told Republicans at the party retreat that he knows “it’s been a harrowing day for all of you.” Pence, a former House member, said he has fond memories of the retreat and the train rides back and forth. “Just know our hearts are with you,” Pence said. “I looked out the side of the window and then I could see a truck, just in pieces out the side of the window,” Comer said. He said Capitol police officers quickly jumped off the train but came back and asked for any doctors to help.